When the city becomes too busy or even too stressful, it’s nice to get lost in a setting of tranquility. In order to enjoy our 220 days of sunshine, we give you some of the best terraces/bars in Lisbon. Lost In welcomes you by the colors of the textiles and the aroma of incense. This seduction is only the teaser. Walk through the labyrinth of rooms filled with a potpourri of Indian merchandise from silken fabrics to finished clothing, and ornamental slippers to colorful scarves. In the rear of the shop, you will find the peaceful oasis. In Cascais, fishing village and beach area, this cafe and gallery feature rooftop with sea view in the center of Cascais, up multiple flights of steeped stairs, where you can also get hand-crafted goods and furniture. In the city’s most multiethnic neighborhood, opened a bar and restaurant at the top of a shopping mall, on the 6th floor, looking out to the castle. It used to be used as storage space, and it is reached by a small elevator. 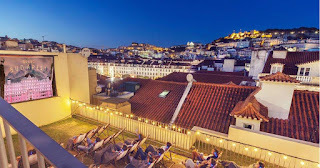 On the terrace, there are wooden structures doubling as tables and seats for snacking, while the interior features a long counter serving meals of Portuguese and international cuisine. There are also castle views from here, through the glass façade. A former break room of factory workers, on a 4th floor, is now a gastropub paying tribute to the river Tagus and Rio de Janeiro. It's still meant to be a place for socializing, during lunch, dinner, and drinks and meals in between, and it still offers the same view of the river and of the 25 de Abril Bridge. The curious decor maintains the industrial feel and consists of tables with multimedia projections and tabletops with board games. There is also a stage by the entrance for concerts and cultural events. Certainly worth a visit for the wonderful view over the Tagus (Tejo) Riverside, located at the trendy Santa Catarina Belvedere. In winter you can sit with a fleece blanket on the terrace but there’s also an indoor room.